Can I Play Taiwan Lotto 6/49 Online? Read Reviews! Any lottery that has a nickname like “Big Lotto” is probably worth giving a try to. Luckily, Taiwan has just the right opportunity for you. Its Lotto 6/49 ranks among the most popular games in the country and the recognizable format isn’t the only reason. Taiwan’s Big Lotto impresses with an interesting history and some pretty spectacular jackpots that have been handed through the years. Here’s a bit more about it. Taiwan Lotto is a classic 6 out of 49 game. It belongs to the portfolio of Taiwan Lottery – the country’s national operator. Ever since its inception, the game has been guided by one important rule – 55 percent of the funds generated through ticket sales have to be handed out in the form of prizes. As a result of this policy and the rollover system, the Big Lotto jackpot has reached rather impressive sums a couple of times. This fact comes together with the relatively low ticket prices and the two drawings per week to determine the popularity of Lotto 6/49 in the country. Is Taiwan Lotto 649 a Scam? Taiwan Lotto 6/49 is legitimate and operated by a national entity. State-run games like Big Lotto are actually the only legal form of gambling in the country. The lottery we’re speaking about is one of the two biggest in the country, the other one being Super Lotto (6/38). While the formats are pretty straightforward, both games come with an array of wagering options and systems to choose among. Thus, players are given a chance to be strategic and increase their odds of winning a prize. All lotteries in Taiwan are under the management of the Chinese Ministry of Finance. The actual tickets are sold and the funds are managed by the China Trust Commercial Bank that bought the opportunity from Taipei Bank in 2007. Very strict regulations are in place and over the years, several investigations have taken place about illegal gambling activities and transfers of large sums of money. As you can see, such offenses aren’t taken lightly in Taiwan. Thus, you can rest assured that the lotteries available to players are 100 percent legitimate and safe to try. Apart from Lotto 6/49, Taiwan has a number of other intriguing lotteries. The most popular games in the country include Super Lotto, Keno, Lotto 539, Tic Tac Toe, Draw 3, Draw 4 and an array of scratch card options. How to Play Lotto 6/49? 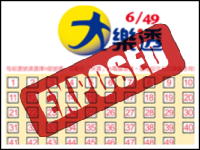 To participate in a Taiwan Lotto 6/49 drawing, players have to select six numbers from a pool of 49. Matching all of the numbers for the respective drawing will result in a jackpot win. Apart from the main numbers, an additional special number is drawn each time. Players don’t mark this seventh number on their ticket, but it is used to determine winners of the second, fourth, sixth and seventh prize tiers. Every single ticket costs 50 Taiwanese dollars or approximately 1.6 US dollars. Players who choose to play one of the numerous systems will have to be prepared to spend a bit more on the acquisition of their lucky piece of paper. Big Lotto has eight winning prize tiers, the top one being the jackpot. The odds of winning the jackpot are 1 in 13,983,816. If there’s no winner for the respective drawing, the sum will roll over towards the next one. Thus, the Taiwan Lotto 6/49 jackpot can reach some pretty impressive figures. The biggest jackpot in the history of the game fell in 2012. At the time, the sum had reached over 1.7 billion Taiwanese dollars or 53.6 million US dollars. The event contributed to national hysteria and the biggest number of tickets being sold in the history of the game. The massive sum was split between five lucky ticket owners who has all gotten the correct combination of numbers. The second prize is handed to individuals who have five correct numbers and the bonus number. Six percent of the prize pool is dedicated to the second prize tier. The same percentage is dedicated to the third prize tier, as well. The smallest prize is 400 Taiwanese dollars and it’s handed to the players who get either three correct main numbers or two main numbers and the bonus number. Winners need to remember a couple of important facts in order to claim their Lotto 6/49 money successfully. Prizes can be collected in a couple of ways. Sums of up to 2,000 Taiwanese dollars can be claimed at any branch of China Trust Commercial Bank. Alternatively, a designated financial institution may be capable of paying out the award. Sums in the range from 2,001 to five million dollars will be paid out at a branch of China Trust Commercial Bank. For a prize of over five million Taiwanese pounds, the player will have to contact the customer service headline or the lottery’s main office in in Taipei City. The lottery is committed to protecting the anonymity of big winners, which is why such a preliminary contact will be required before the sum is paid out. When it comes to taxation, prizes of up to 2,000 dollars aren’t subjected to an income tax. For larger sums, 20 percent of the prize will be withheld prior to getting paid out to the winner. Can You Buy Taiwan Lotto 6/49 Tickets Online? Currently, Taiwan Lotto 6/49 tickets aren’t available for purchase online. People who are on the territory of Taiwan can acquire a ticket, regardless of their nationality. Would you mind rating Taiwan Lotto 6/49 ? As you can see, the list of pros is clearly longer than the one of the shortcomings. If you happen to be in Taiwan, you can definitely give Big Lotto a try. A standard 6/49 game, this one produces juicy jackpots via rollovers and is definitely a nice option to try. The two richest lotteries in Taiwan are Taiwan Super Lotto (威力彩) and Taiwan Lotto 6/49 but I prefer Taiwan Lotto 6/49 because the games are straight forward and easy to play. I remember At one point in 2012 when the jackpot reached NT$1,712,238,207. It was madness!